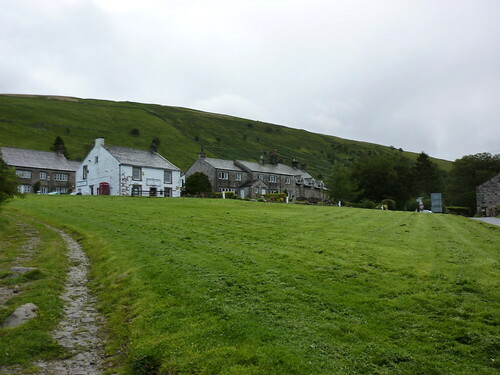 In which our hero walks along a river and then some more river, occasionally shedding clothes before heading up some hills, through some mud, says hello to the Pennine Way and sees some sights to behold and no mistake. “You look like you’re prepared for it,” proclaimed the hostel warden from behind the Post Office counter that was also his reception desk. It featured a glass screen which could be raised or dropped at the touch of a button, which seemed to delight him no end. The statement of preparation was weather related. Ever since I’d woken up at 7am there had been regular bouts of heavy rain showers, followed by, say ten minutes of peace, before it all started again. He was a chatty bloke. Every time he’d seen me since I’d arrived the night before he’d been making conversation. Maybe it was what he did to lone walkers and frankly I wasn’t going to argue. There’s nowt worse when you’re walking alone and you realise it’s 7pm and the only things you’ve said to a human being all day is “thanks” when someone has given you breakfast, and “a pint of Theakston XB” to someone at the end of the day. Much as I wanted to stay and find out the secret of hostel warden happiness (especially as it had started raining again) it was time to set off on my longest day of walking on the trip – seventeen and a half glorious miles to Ribblehead where three of England’s finest fells, a night at the Station Inn and a view of a mighty fine viaduct would greet me. But first I had to get there. 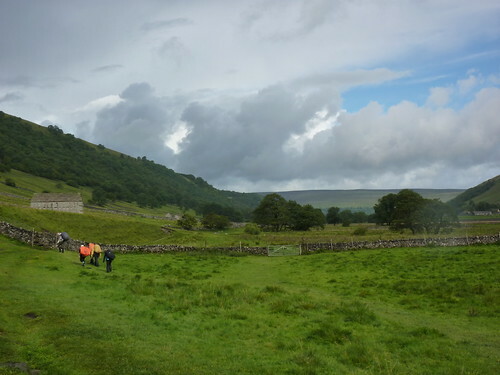 The first four miles were to the village of Buckden following the River Wharfe once more, however always staying a respectful distance from it and I spent the journey tramping along lush grassy paths through fields and picking my way past sheep. The heavy showers had at least disappeared and the rain was rather light. There were few people out – just the odd dog walker and a group of teenage girls who were plodding along in silence. It was surprising to see them – most teenage walkers with huge rucksacks tended to be boys, usually having some kind of “who can carry the biggest rucksack” competition. I’d seen one such group the day before, who, unusually, were joined by a lone female whose pack was, in contrast, the total opposite and who left you with the impression that she’d either joined them for the day, or that all her belongings were being split between several of her fellow walkers! Catching up with the ambling group of girls, the mystery of the orange rucksack was finally revealed. As I’d been walking behind them, one of the group had been rather noticeable for their rather strange looking, oddly shaped looking rucksack. Overtaking them I noted with interest the cause. Clearly having forgotten her rain cover, her rucksack was being protected by a bright orange survival bag, hastily lashed on in an attempt to keep the water out. Leaving them behind to plod onwards I passed the wonderfully named village of Starbotton and as the rain stopped, took a moment to rest on a nearby log. All of a sudden the stiff breeze that had been chilling me all morning stopped and immediately I was set upon by a small army of tiny insects to whom I was clearly the most exciting thing they’d seen since that sheep had run off a few hours before. My attempts to bat them off failed in spectacular fashion and in the end I plucked a boiled sweet out of my rucksack and set off once more, leaving the insects to wonder about me for the rest of their minute lives. Well all those that hadn’t ended up inadvertently squashed between the pages of my guidebook when I’d closed it. With a short stroll I was soon in Buckden, a village dating back to Norman times and whose shop proclaimed in large neon letters that it sold hot pies and pasties. For a moment I was sorely tempted even it if was only 11am and wasn’t hungry. Instead I meandered around the village green, admired the public conveniences (if I was to ever write my “Good Loo Guide”, those operated by the Yorkshire Dales National Park would certainly get a starring role) and popped into a small National Trust exhibition which spoke about rivers and badgers and seemed to be aimed at someone just ever so slightly younger than myself. By the time I’d torn myself away from the prospect of a hot pie and left the village of Buckden (which to be fair didn’t take long – I only stayed about fifteen minutes) the sun had come out and the inevitable cloud was slowly being replaced by large patches of glorious blue. The Dales Way now joined the river bank itself and I walked along as birds flew around, chirping contentedly. Next on the list was the tiny village of Hubberholme which, by all accounts, has a fine church with an oak rood loft. It’s one of only two in Yorkshire, proclaimed the author of my guide book rather too excitedly for my liking. I had absolutely no idea what an oak rood loft was, nor why it was important however it appears that it’s very rare thanks to Elizabeth I taking a dislike to them and insisting they be destroyed. Quite why old Lizzy took offence at such things, and how Hubberholme’s managed to survive, was not something the author had deemed important enough and I certainly wasn’t going to find out. As I approached the church I noticed a large group in the churchyard, standing around some gravestones. All wearing brightly coloured clothes, they were probably on some sort of history talk (“and so here we come to this beautifully preserved example of an oak rood loft, which as you can see is…”) however just in case it was a funeral or something, I maintained a respectful distance and headed on my way, perching on a rock briefly to divest some clothing as it was getting rather warm. I’d opted to keep my waterproof trousers on, but unzip the legs of my walking trousers to convert them to shorts (thanks to being lined inside, my waterproof trousers were more than wearable over shorts!) and it was no bad thing as no sooner had I sorted myself out, the rain began once more. It was only a brief shower and by the time I’d stopped for lunch at the curiously named Yockenthwaite (which apparently translates as Eogan’s Clearing which makes just as much sense) most of the rain clouds had disappeared. I’d chanced upon an utterly gorgeous picnic spot, resting on a comfy rock overlooking a series of cascades which the River Wharfe flowed over happily. I wasn’t the only one to like it and as I rested a passing dog jumped in, splashing happily in the water and trying to catch the resulting spray in its mouth. Further on up, just past the small farm settlement with the strange name, the cascades became even more attractive and the scenery began to take on a remote feeling. Whilst the footpath was mirrored by a road on the other side of the river, there was no-one using it and there were few buildings. The area had the feeling of being stuck in the middle of nowhere, even if the grassy path did look like someone neatly clipped it on a regular basis. The fields nearby were full of wild flowers and it would have felt even more relaxing had I not realised I was running behind schedule. By the time I arrived at the even more remote hamlet of Beckermonds, it was 2pm and I still had eight miles to do. 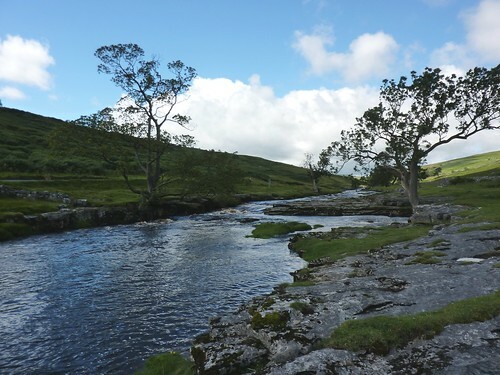 It was also time to bid a fond farewell to the River Wharfe and climb uphill on the road to the village of Oughtershaw before heading off along a track to the farms of Nethergill and Swathgill. My legs were beginning to ache a little after spending a lot of the day walking on tarmac and stone, although what came next was less welcome as I ended up traipsing through muddy and boggy fields wishing I’d put my gaiters on. By the time I’d realised my mistake, both boots and trousers were covered in dark brown mud. The bad drainage did, at least, come with a view. Up ahead, looking dramatic in shadow, the mighty peak of Inglebrorough came into sight, reminding the walker of what was to come further along. 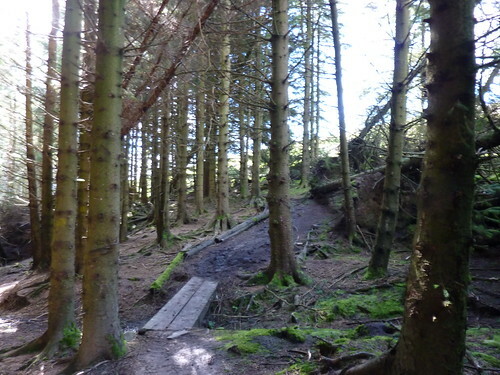 Popping through the even more remote farm of Cam Houses, the Dales Way took a brief diversion through Cam Woodlands, a dense forest where the footpath had almost seemed to be an afterthought to its maintainers. Many of the trees had been uprooted making the path look like it hadn’t expected to have been there and even though the traverse through its top corner lasted less than five minutes, the place seemed dark, dank and oppressive and I couldn’t wait to get out and back on to the damp muddy fields instead. The thought of walking through it on a dark, wet and gloomy day, filled with cobwebs, spiders and bats filled my mind and I was eternally grateful for the fact that the sun was still shinning brightly. Getting out of it was a happy and glad moment, even if it did mean I now joined a path of such poor quality that it made the earlier mud look like a well paved highway. Such torture was thankfully brief and the contrast at the end was sharp once more as I rejoined the old friend of the Pennine Way running along Cam High Road. A wide, gentle sand and gravel path, Cam High Road is believed to have prehistoric origins and was developed and upgraded by the Romans. The name however is much newer, referring to wool traders which used the route in later centuries. As the road banked round the hill gently, a grand view was revealed. I’d already seen the distinctively shaped Pen-y-Ghent and the large lump of Ingleborough; two of the peaks for which the area is rightly famous for, and now the third arrived. Slowly but surely the mighty Whernside came in to view, along with its smaller but more famous neighbour, the Ribblehead Viaduct. As dramatic reveals go, there could be none finer as they gently appeared on the horizon. The end was now in sight, even if it was still a few miles off. As the Pennine Way turned off towards the village of Horton-in-Ribblesdale, I hurried downhill towards Gearstones where I left the Dales Way for the day. 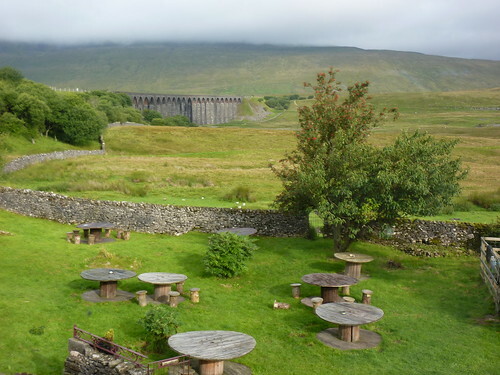 With just a mile and a bit to do and a pub and beer awaiting my arrival, I headed down the road to Ribblehead taking in the sights and making appreciative noises about that mighty viaduct. 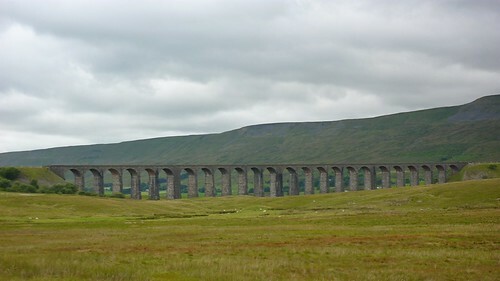 Built as part of the third mainline railway route to Scotland in the 1870s, Ribblehead is perhaps the most famous viaducts in the country after it became the focus of the campaign to save the Settle to Carlisle railway line. It was also the cause, with British Rail proclaiming that it was unsafe and that it was too expensive to repair. The closure plan was roundly criticised and the campaigners managed to uncover that British Rail had overblown the cost of repairing the viaduct, as well as deliberately reducing services and diverting traffic away from the line in order to provide “evidence” for its plans. After a huge amount of campaigning, the proposals were rejected and the line has grown and thrived ever since. With an emphasis on tourist travel and with many closed stations reopened, passenger traffic has increased, and the line is now heavily used by freight trains. There can be few structures in the world that manage to complement the natural landscape so much. 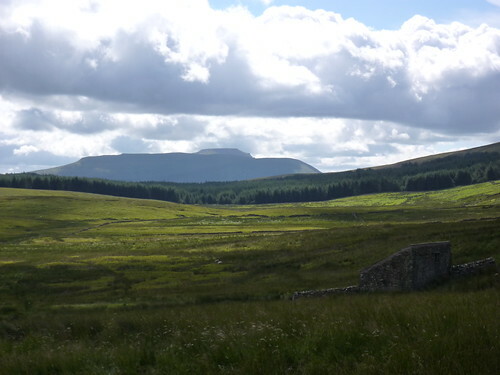 Ribblehead sits nestling under the fells, a giant in some respects, yet in others small and insignificant. Its twenty four arches and huge number of bricks stand in the landscape as a huge monument to the navvies who built the structure all those years ago. It had been many years since I’d travelled over the viaduct myself. As a teenager I spent many a happy school holiday on trips out with my Granddad. Both being lovers of train travel, we’d head off somewhere and see what we could find. One particular school holiday we headed to Leeds to join the train along the Settle to Carlisle line. I have vivid memories of admiring the well preserved stations, full of hanging baskets and freshly painted lamps and looking back now it’s hard to believe that it was only a few years after British Rail’s closure attempt. Then transport secretary Michael Portillo proclaimed that putting a stop to the closure plan was the best thing he ever did in politics, and many lovers of the Settle to Carlisle line would certainly drink to that. 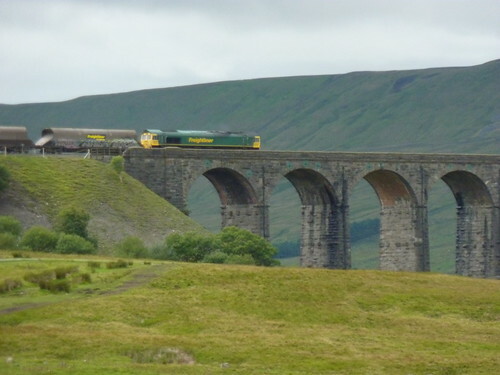 In recent years I’d seen and used the line whilst doing the Pennine Way, including the bizarre sight of a Virgin Pendolino travelling over the viaduct on its way to Glasgow as part of an engineering work related detour. Hauled by a diesel locomotive at the front, it must have been an amazing if not unexpected journey for those lucky enough to be on board. But what I really longed to see now was a steam train running over those hallowed arches. Sadly all I got was two freight trains hauling coal wagons, which wasn’t quite the same. Still, on arriving at the Station Inn where I was staying, I was delighted to find my room was one of the few at the back of the building and had a fine view of the viaduct. The bar didn’t, although the beer garden and toilets did. As I’d arrived clouds and fog has descended on the air giving the whole place an eerie feel. After a steak and kidney pie with chips that were positively swimming in gravy (and frankly that should be the default state of affairs for good chips – my father-in-law’s experiment of chips, mushy peas and curry sauce not really cutting the mustard for me) I was forced out of my seat in order to escape a TV on full volume. The pub was breaking Rule 1 of Bods’s Good Rural Pub Guide by even having a TV in the first place, but the fact that only the barman seemed to want to watch it made it even worse. Raising my eyebrows, I retired to another part of the bar where I could just about escape the irritation, and attempted to take in my surroundings. Now when my literary hero Bill Bryson does such things, he inevitably ends up with a notebook of humorous anecdotes and drunken phrases which make hysterical reading. Whilst I can do the drunkenness thing, the anecdotes were rather thin on the ground. All I could really get from my eavesdropping was that the barmaid was from Darlington and lived in a caravan down the road; that there was to be a big wedding in a few weeks time; that the pork pies are award winning and that the kitchen uses as much local produce as possible. Oh and they like to cook veg which had only been picked 24 hours before. Such useless information perhaps wasn’t worth four pints, however the knowledge that the barman cleans his beer pipes and then chucks the cleaning fluid out of the front door because if he put it down the sink, it would “kill the septic tank” is a fact that will be with me to the grave, and with that knowledge I was ready for anything. Especially bed. First Published: 12 January 2011. Last Updated: 18 November 2015.